Japan has many traditional children’s games and toys dating back hundreds of years. Many originate from the Edo period, when Japan had relatively little contact with the outside world. The toys’ simplicity and ease of use, and gorgeous designs have made them popular into the present day. Because fun is universal, we’ve picked 7 traditional Japanese games and toys that we think will resonate with almost anybody—check them out and even pick one for yourself! 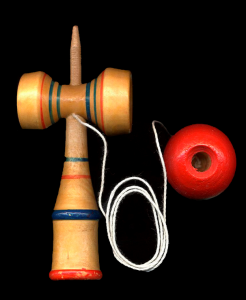 Kendama is one of the 20th century’s quintessential traditional Japanese games. Even today, Kendama can be found everywhere and national kendama tournaments are common. “Ken” refers to the shape, a wooden handle resembling a sword hilt. There is a spike on the top, and cups on either side and on the bottom. “Dama” is the ball, which is attached to the handle with a string and has a hole in it fitting the spike. The goal is to swing the ball in the air and make it land on the top spike or inside any of the cups. It’s said there are over 1,000 Kendama techniques! When it comes to traditional Japanese toys, simplicity usually wins out. Koma are wooden tops, often painted with bright colors. 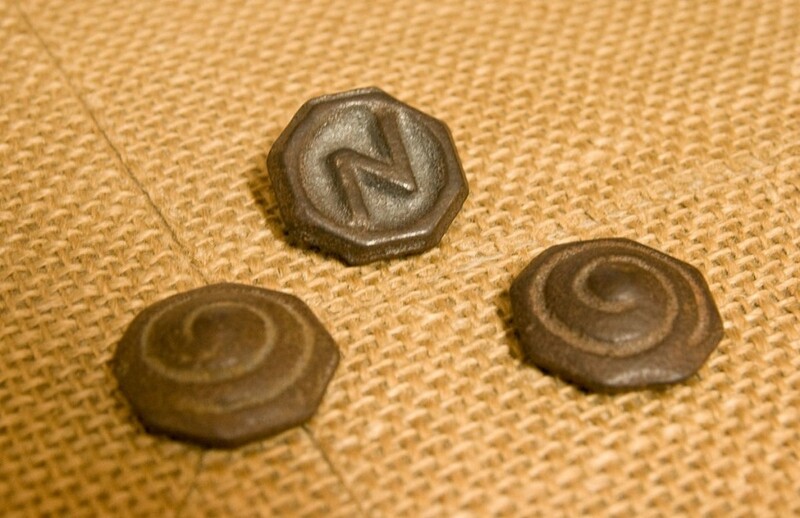 Beigoma are another type made of iron that was popular in the Showa period. Tops come in a variety of shapes and sizes and can be spun by hand or using a string. There are different games using these tops, but the most basic one is to use your own top to hit another top and knock it down. The Japanese game of Beyblade, in which opposing tops do battle in a tiny “stadium” setting, is a modern variation on this ancient pastime. 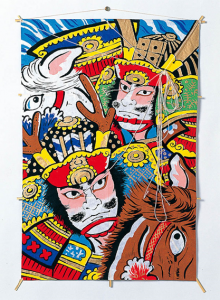 Like many Japanese traditional games, Hanetsuki is somehow familiar—like badminton, it is played with rectangular wooden paddles (hagoita) and a colorful shuttlecock (hane). Dating back 1,300 years, Hanetsuki is one of Japan’s oldest games and was enjoyed by girls in the beginning of the New Year. Whoever let the shuttlecock hit the ground would lose, their face marked with black ink. The longer the shuttlecock remained airborne, the better one’s fortune in the coming year! Nowadays, many people keep the paddles for decoration. 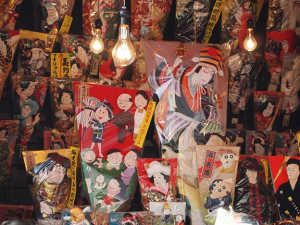 They often feature motifs such as Kabuki actors and women in kimono, as well as modern designs featuring popular characters like Hello Kitty and Harry Potter. Daruma Otoshi (“The Falling Buddha”) is another of many traditional Japanese toys made of wood, in this case a Daruma doll based on Bodhidharma, the founder of Zen Buddhism. 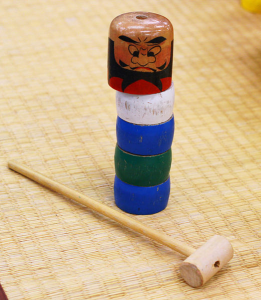 In Daruma Otoshi, the Daruma doll is a tall cylinder with five separate stacked pieces in different primary colors, with the head placed at the very top. Using a small hammer, the goal is to start at the bottom and knock away each section without disturbing the rest of the stack—until only the head remains! If the Daruma falls down before then, the game is over. How would you stack up? Tako are old-style kites traditionally made with Japanese handmade paper and bamboo. Although Japanese kites date back to the Nara period (649-794 AD), different regions became known for different designs during the Edo period. Tokyo kites were rectangular and painted in a woodblock print style, while Nagasaki is still known for its diamond fighter kites. Nagoya has kites based on insect shapes like horseflies, cicadas, and bees, each with a hummer that buzzes in the wind! Hamamatsu makes hexagonal kites which are used in a Boys’ Day (May 5th) kite festival. Teams compete to keep in the air and cut down the other team’s kite lines. 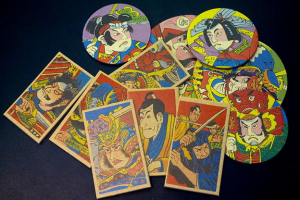 Menko is one of a few traditional Japanese games played with circular or rectangular cards. The cards have pictures on one side reflecting popular trends. In the Edo and Meiji periods, images of ninja and samurai were popular; more recently, anime, manga and collectable baseball cards trump tradition. Menko is played on a hard floor with at least two people. After one player places a card face down, the other tries to flip it over by throwing another card on top of it. Players who turn their rival’s card face up can keep that card. In the end, the person with the most cards wins! While many traditional Japanese toys are home-grown, some are imports that have become strongly associated with Japan throughout the years. 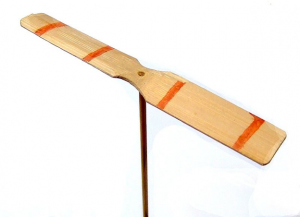 A Taketombo, also known as a “bamboo-coptor” or a “bamboo dragonfly,” actually originated in 4th century China. it consists of a stick topped with a helicopter like propeller. To make it fly, you roll the stick part quickly between your hands and release it. It’s a bit like those helicopter plants we all used to play with, only you can take it home. There are many other kinds of traditional Japanese games and toys, such as the den den daiko or pellet drum, karuta, another slapping card game, kamifusen, waxed paper balloons, and ohajiki, or marbles. 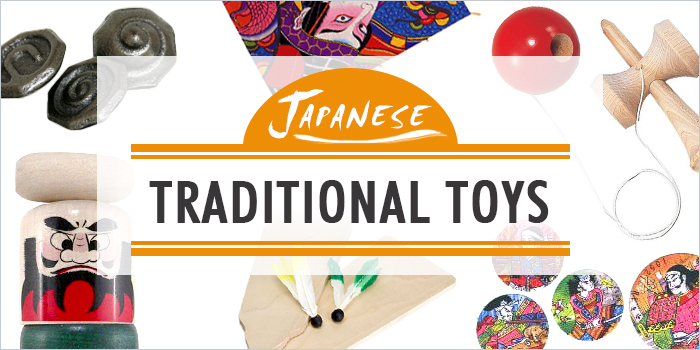 Japanese traditional toys make an excellent present to people who value high quality design and materials, and children who simply enjoy fun diversions no matter the culture they come from. If you’re game to try any of these are know someone who is, head over to FROM JAPAN’s product site and see what catches your fancy! Sakura 2019: the best cherry blossom-themed items this year!